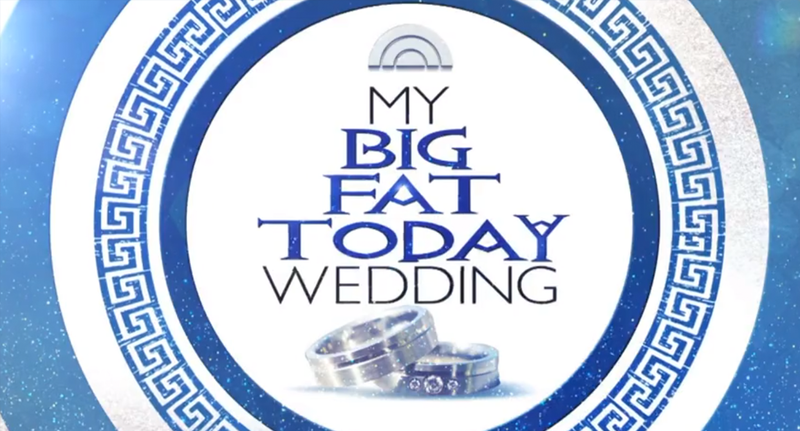 NBC News‘ “Today Show” has pulled out a timeless Greek design motif for its “My Big Fat Today Wedding” series. The series, which is a not-so-subtle cross promotion with NBCUniversal’s “My Big Fat Greek Wedding 2,” is featuring couples of Greek ancestry. As in past “Today” weddings, the elements of the ceremony and reception will be decided by viewer votes. To mark the blessed event, “Today” is using a blue and white (the colors of the Greek flag) color scheme on its normal ring motif — and replaced one of the rings with a design element called a meander. Meanders, also known as Greek keys, are a repeating motif created by a single line. The design itself has been found in Greek art going back nearly two thousand years. Today, it’s found frequently on textiles and welcome mats. The graphics for the series also includes a Greek-inspired font.